On the evening of Inauguration Day, the White House was opened to the public. The party ended near midnight. Thousands of people went to see President Lincoln. Lincoln was glad the celebrations were over. Now he could get back to the urgent problems that faced him. He hoped that during his second four-year term he could end the Civil War. He hoped he could ease the bitterness and hatred the war had brought. Lincoln hoped for an easy peace. He wanted no hangings or other brutal acts against the losers. He wanted to see Confederate soldiers go back to their homes to become peaceful citizens of a united country. Lincoln wanted the nation to grow together again. The war could not last much longer. The South already was defeated. But Confederate leaders refused to accept defeat. 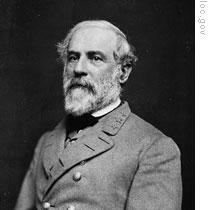 General Robert E. Lee's army still held the area around Richmond, Virginia. 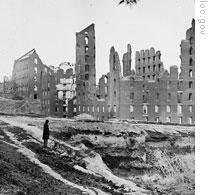 Richmond was the Confederate capital. Lee did not believe, however, that he could hold the city much longer. His once mighty army now had less than fifty thousand men. These men were tired and hungry. And they had to defend a line almost sixty kilometers long, from Richmond to the city of Petersburg. There just were not enough Confederate soldiers left to fight. Lee decided that his only hope was to give up the two cities. He would march south and join General Joe Johnston's army in North Carolina. Perhaps the two armies could defeat Union forces moving up through the state. Then they could turn to meet the army of General Ulysses Grant. This plan had little chance of success. But it would keep the Confederate armies active for a few more weeks or months. Lee soon discovered that it would not be easy to break out of the trap that Richmond and Petersburg had become. Grant's army seemed to be everywhere. 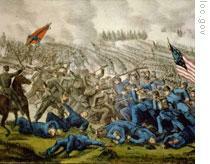 Lee put eleven thousand of his men into position near Grant's line. They waited for the enemy to attack. At first, the Confederates received some help from the weather. Heavy rains fell for more than a day. Many roads and fields were flooded. The Union army could not move forward. When it did, the Confederates were ready. They pushed back the attackers. The victory did not last long. There were five times more Union soldiers than Confederate soldiers. The Confederates fought hard, but could not stop them. They were forced to withdraw. The Confederates moved slowly, then more quickly as Union troops chased them. They began to flee wildly. About half of them were captured. Grant ordered an immediate attack all along Lee's line. He was sure the line was weak. He was sure he could break it. A Union army doctor watched the battle from a distance. He said he could see the flash of light from Confederate guns along a line a kilometer long. After a while, part of the line went dark. Then another part. And another. Flashes of gunfire became fewer. Finally, all of the line was dark. The doctor said he knew then that the Confederate line had fallen. General Grant had been trying to break General Lee's line for almost a year. Now he had done it. His troops raced forward to seize the railroad. Lee no longer had a way to supply his troops in Petersburg. He no longer had a quick way to move his army south. He would have to move west first, then turn south. This meant he would have to give up Richmond. The government of the Confederacy would have to go with him or be captured. Confederate President Jefferson Davis gave the order to go. 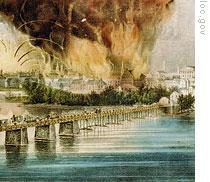 Southern soldiers began to burn military supplies they could not take from Richmond. Huge amounts of shells and gunpowder were exploded. The fires got out of control. Many buildings burned to the ground. The streets were filled with refugees trying to escape the burning city. Mobs broke into stores looking for food. Union troops quickly moved into Richmond. Then they raised the United States flag over the once proud capital of the Confederacy. President Lincoln visited Richmond on April fourth. He visited the Confederate state house where the rebel Congress had met. He had lunch in the Confederate White House where Confederate President Jefferson Davis had lived. Everywhere Lincoln went, hundreds of people crowded around him. Blacks, especially, wanted to get near him. They wanted to touch the man who had made them free. At no time was any kind of hostile act made against the president. In the next few days, Lincoln followed carefully Grant's campaign against Lee's withdrawing army. By telegraph and messenger, he was informed of every move. Lee's men marched without food. They did not have time to search for it. They could not stop. The Union army was only a day behind them. On and on they marched. Many of them -- weak from hunger and tired beyond belief -- could go no farther. They left the road to sleep. Most never got back. Others continued to March. But many threw down their guns and equipment. Union forces attacked the moving line when they could. There were battles at such places as Amelia Court House, Sayler's Creek, High Bridge and Farmville. Lee's army fought off each attack. But it was slowly bleeding and starving to death. Lee asked one of his officers to report on the situation. "There is no situation," the officer said. "Nothing remains, General Lee, but to put your poor soldiers on their poor horses and send them home in time to plant the spring crops." Lee answered: "What would the country think of me, if I did that." "Country." the officer cried. "There is no country. You are the country to these men. They have fought for you. Without pay or food. There are still thousands of us who will die for you." On April seventh, General Grant sent a message to General Lee. He said it was hopeless to continue the struggle. He asked for the surrender of Lee's army. Lee did not agree that the situation was hopeless. He believed there was still one small chance to escape. He wanted to reach a place called Appomattox Station. There his men could get food. Then they could march to Lynchburg where a railroad would carry them south to safety. But the Union Army reached Appomattox Station first. 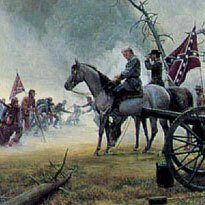 Lee and his officers decided to make a final effort to break out of the circle of Union forces. If their plan failed, Lee would have no other choice. He would have to surrender. Lee rose early on the appointed day. He put on a new gray coat and a bright red sash. He looked as if he were going to a parade. His officers wondered. Then Lee explained: "I probably will be General Grant's prisoner. I thought I should look my best." At sunrise, Lee arrived on a hill outside the town of Appomattox Court House. He looked down on what was to be his final battlefield. His men fought hard and well. But they could not break through the Union line. Finally, Lee said: "There is nothing left me but to go see General Grant. And I would rather die a thousand deaths." Lee was sure Grant would not demand unconditional surrender. He said: "Grant will give us good terms -- as good as we have the right to demand. I can surrender this army on the condition that its members will never fight again." Lee turned his horse toward the enemy lines behind his army. He sent a message to General Grant. It said: "I now request to meet with you at such time and place as you may name to discuss the terms of the surrender of this army." The place would be a home in a town called Appomattox Court House. That will be our story next week. Our program was written by Frank Beardsley. The narrators were Kay Gallant and Harry Monroe. 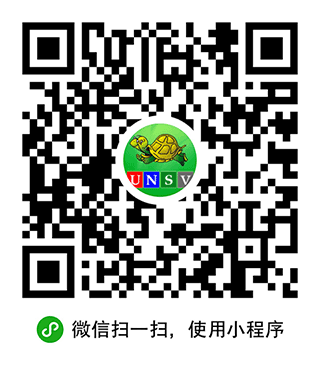 You can find transcripts, MP3s and podcasts of our programs along with historical images at www.unsv.com. You can also follow us on Twitter at VOA Learning English. Join us again next week for THE MAKING OF A NATION -- an American history series in VOA Special English.